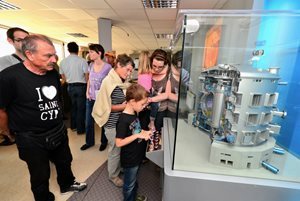 Two milestones in ITER construction were achieved as summer 2014 drew to a close—the last pour of the Tokamak Complex basemat on 27 August and the delivery of the first completed components on 4 September. 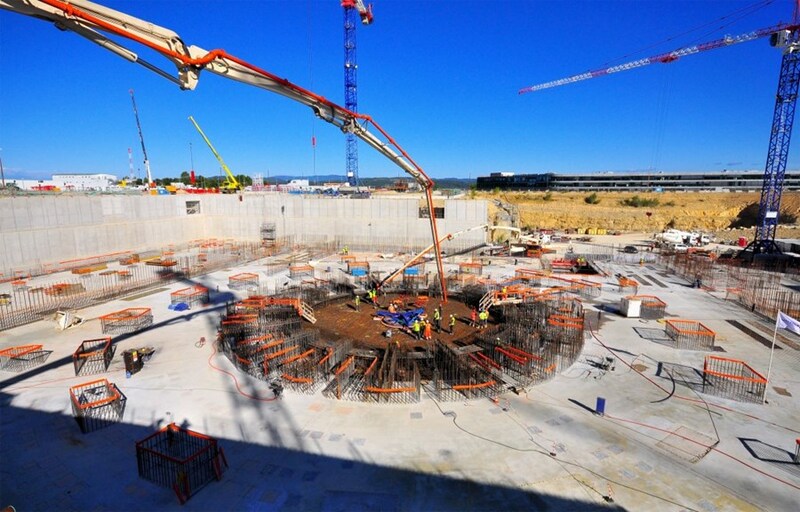 It was the last of fifteen "segments" poured to complete the 9,300 m² concrete basemat that will support the Tokamak Complex and its 400,000 tons of building, machinery and equipment—a perfectly circular, central plot that will support the ITER machine. 14,000 m³ of concrete, 3,600 tons of rebar, 8 months of work—the ''floor'' of the Tokamak Complex was finalized on 27 August 2014. Well before dawn on 27 August, the team was in place to prepare the worksite and position the concrete pumps. Ahead was a 12-hour continuous pour—some 865 m³ of concrete formulated to penetrate in and around the tight weave of rebar, particularly dense in this area of the basemat. The completion of the Tokamak Complex basemat has opened the way to a new phase of ITER construction: with the "floor" in place, work will now start on the walls. The 80 x 120 metre Complex, housing the Tokamak, Diagnostic and Tritium buildings, is a seven-storey structure that will reach 60 metres at its tallest point. 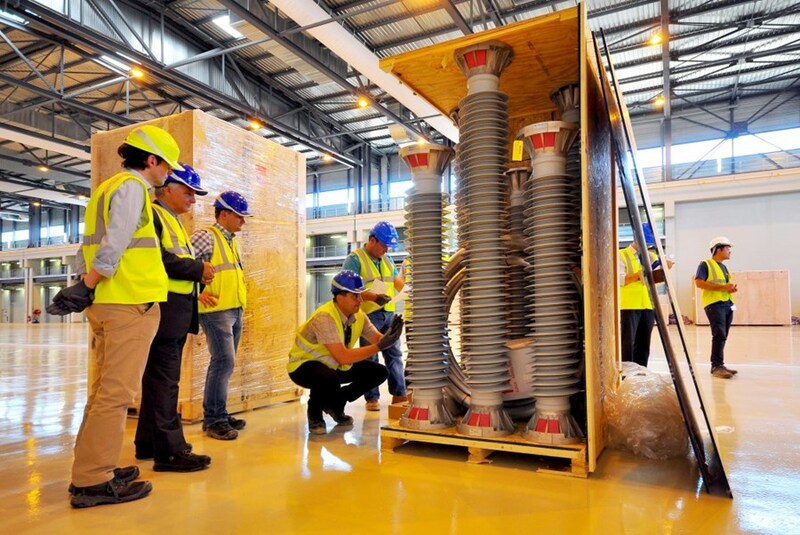 Shipped from New York on 5 August 2014, the 12 surge arrestors that were delivered to ITER on 4 September had a high symbolic value. As the first completed components to reach the site, they usher in a new phase on the road to building ITER. Early September, another ITER milestone was celebrated as the very first completed components—12 high voltage surge arrestors shipped from the United States—were delivered to the site and stored. 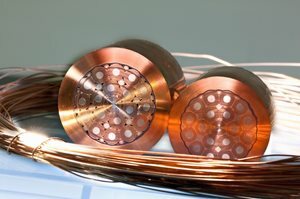 Destined for the installation's steady state electrical system, they'll take their place between the 400 kV switchyard and the transformers that will feed power to the ITER plant systems and components in order to provide protection from the type of major voltage surge that can be caused by lightning. One truck, just a few crates ... but a delivery with important symbolic value, as it kicks off a new phase for ITER. Over the next years thousands of components will be shipped from around the world for installation into the ITER Tokamak and plant. This first delivery was the opportunity to test the administrative, technical, industrial and regulatory procedures that will accompany the procurement of all of these machine and plant components.